Government Jobs in Pakistan for Fresh Masters announced as PM ICT Internship 2017 Apply online. 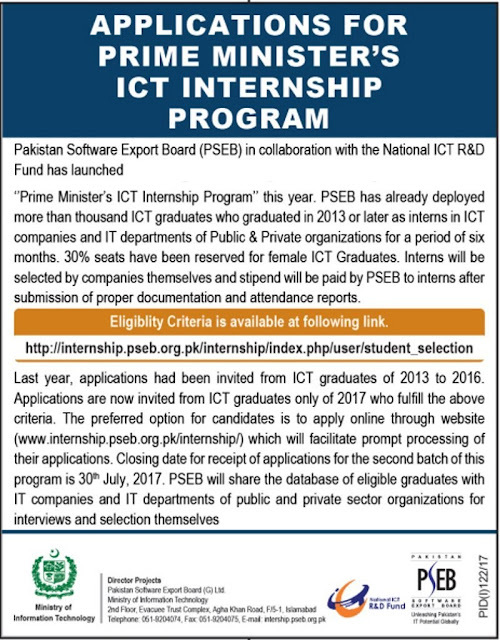 Candidates are required to visit the site for apply online on Prime Minister’s National Internship Program 2017 PM ICT by clicking on link given below. Candidates must have 16-18 years of education. Candidates must be a Pakistani Citizen. Candidates Should not be employed. Rs.15000/- PM will be paid as STIPEND during their internship. 1st batch of interned will be deployed in August 2017.